Synonymous with power and strength. With its spacious cabin, the C600 Bull offers comfort and ease of operation unequaled in the mulcher industry. It is ideal in even the most difficult work conditions. The C600 Bull is available with a 600 HP John Deere or Caterpillar Engine. Along with proven hydraulic components, the Bull C600 allies mulching power with exceptional tractive effort for maximum productivity in the field. 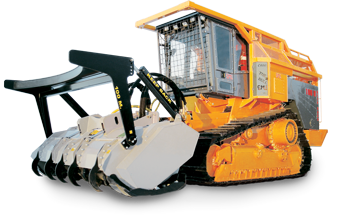 Equipped with a hydraulically powered mulcher head with a cutting capacity of 98 inches (250cm), the C600 Bull can mulch through stumps and roots with ease. 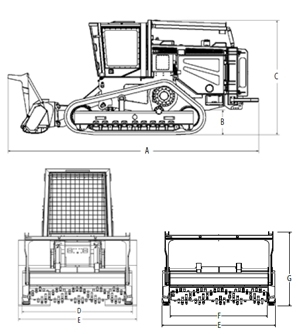 True to C.M.I design, the C600 Bull offers an ease of maintenance unrivaled in the mulching industry. Known for its strength and mulching power, the C600 Bull works exceedingly well for site preparation where sub-soiling is necessary. It also makes short work of stumps and roots to large depths.